Yet another Error Code that Windows 10 Users are facing recently is Error Code 0x803F7001. There are numerous errors that users are going through but Activation errors are most annoying. This Activation Error Code 0x803F7001 in windows 10 is caused if you Clean install Windows 10 using flash drive. This Error may also occur if you update your BIOS. Possibly there can also be issue with Microsoft activation Server and thus you are shown that your windows is not activated, In this case you can only wait and verify if it is the issue from Microsoft's side or the recent changes that you made to your PC. Let us now see how you can solve this Activation error by doing few steps. There are 3 Methods that you can perform right now to solve the issue. Method 1: Entering the Keys. Go to Start > Settings > Update and Security > Activation > Change Product Key. Now enter the Product key of the original OS you had earlier before Upgrading to Windows 10. Then navigate to Change Product key and Enter it there. Following Above steps should activate your Windows, but can not work Every time. Check Method 2. Method 2: Activating Windows 10 using Phone. This Method Requires you to use your Phone and Call the toll free number. The Method is Shared by one of the Microsoft Support Engineer. Step 1: Keep holding Windows key and Press R key to open up Run Command. Step 2: Type Slui 4 in the Run Windows that pops up and hit Enter. Step 3: Next you will require to Select your Country/Region, So do it and Click Next. Step 4: You will be Presented with Toll Free number, Use your Phone now and dial the Number to get the Confirmation ID. Step 5: Once you get the Confirmation ID numbers, Enter them in A to H Field Exactly the way they are Provided. Step 6: Now Click on Activate, That's all !!! 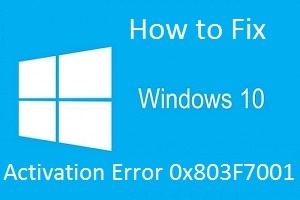 If this method fails to solve 0x803F7001 Windows 10 activation Error then, 3rd and the last method that i am listing below should work for you. If Above mentioned steps don't help you then you need to Check and Scan your PC for Corrupt System files or any minor registry corruption issue Using Total System Care. Scanning with this program will let you know about Problems your PC has which might in your case prove to be the Culprits. Even the Minor issue can prevent you from activating your Copy of Windows. You can do a Full Scan of your PC right now with Total System Care. Method 3: Follow the Cycle again. In this method you will be required to follow the Cycle of Installing Windows 7/8 or 8.1 whichever OS you have with Product key. Then after its done, Download Windows Media Creation tool and Use "Upgrade this PC" Feature to Upgrade your PC from your Currently installed OS to Windows 10. More information about how to use this tool can be found on Microsoft's official site. If everything works fine, then you should be able to Upgrade to windows 10 Smoothly. Now if you don't feel Comfortable with the Upgrade and wish to Clean install Windows 10 using Flash Drive then now feel free to do it. I hope any of the above listed method Works for you to Fix 0x803F7001 Activation error. If you have any other way by which you managed to fix the issue, then feel free to share it with us in Comment box below. Hello and thank you for your article. I have a windows 8.1 product key and I have upgraded to windows 10 and activate it. But I have formated my hard disk so I flashed a windows 10 iso from a DVD. Now I have the 0x803F7001 error and the first and the second method didn't worked for me. I will flash windows 8.1 then use the free upgrade again but what about if I want to do a clean install in one year, when previous 8.1 users won't be able to upgrade? Hi - Slider -, You can Install Windows 8.1 and activate it with your product key, Then Use the Media Creation tool to Upgrade to Windows 10. Now Use Media Creation tool again and Create a Flash Drive. Once it is done, you can go ahead and Clean Install Windows 10. I have done this couple of times and have always worked. Called twice and even have 2 chat logs where they couldn't help. I was running fine and then my motherboard died. I replaced it and I'm getting an Activate Windows watermark that won't go away. I was actually hung up on the second time by the Microsoft rep.
Microsoft support told me that a new motherboard requires a new product key. They did the exact same thing to me. They essentially told me that since I "chose" to replace my motherboard (which I had to considering it died on me), I have no other choice than to buy a new product key if I cannot find my previous one from 4-5 years ago. It's been extremely frustrating communicating with the support staff, they are not friendly at all. Hi Len, Any Hardware Changes will do this if you are running windows 10 OS. I would like to suggest you to try and Clean install windows 8/8.1 or 7 Whichever you have with product key. After clean install completes, Upgrade to windows 10 if you want. Hi Leo, I doubt guys at microsoft support will help you. Because they might ask you for the product key first. If you had it, you could have done it all by yourself again. When i call up windows and enter all the codes they say that they are wrong, tried several times and still getting same issue. i might be stupid right now but in method 2 in the first step i didn't understand what windows key they ment like whereis it on my computer? I own a legal copy of Windows 7 with a Microsoft sticker inside the cd-cover. I bought new Hardware and installed and activated Windows 7 successfully. The system stated the OS as a genuine Windows. Now I wanted to upgrade to windows 10. Everything went well and Windows 10 showed up on the screen. Only one issue was, it wasnt activated, because the LAN-driver was missed. Searching for the driver on another PC, I've found a newer bios too. My biggest misstake was to install this f... bios, before installing the LAN to activate the windows 10. So I ended up with a non activatable Windows 10. I got the very same error code, listed in the title of this topic. Just downgraded my bios and see... I could activate it properly! Do not meddle with your bios during upgrading and activation process and you are fine! Having same trouble. I have BRnd new laptop. Ran the re-install disk and can't activate windows. Been at this all day. I have two computers with legal Windows 7 licenses, a Lenovo Laptop from 2010 and a new Dell XPS. Neither one of them will activate. I did the Windows 10 upgrade. I tried method #2 which failed and they said they'd connect me to an agent and then I got the 'your call could not be completed' message and they hung up. I just built a desktop PC with a legal windows 10 64bit package. I have the official packaging by microsoft and the product key sticker. It worked for a month and just now I logged in and it said "Windows is not activated" I've tried the product key I got with the software and it said it was being used on another device. I've tried everything on this page but nothing I do works. Hi WILLIAM, Sad to see this. You can Contact MS Support if you have genuine copy of windows. They might get your out of trouble. Bought an Apple Computer and Everything was fine! Yeah, I replaced my Motherboard, and got the error. I bought the PC 5 years ago, so the original product key is long gone. Step 2 didn't work either. I ended up just buying a new key. Thank you, it worked really well! SLUI 4 no longer works with Creators Update.